I decided to go with Yamaha XS650 Special wheels, they were about when the Triumph Bonneville T140V and later models were (I owned both in 1979). These wheels where a fairly common mod for choppers in the 80's. I built the swinging arm on a jig I made, from 50 x 25mm box section. 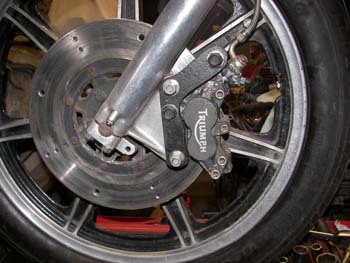 It uses standard Triumph swinging arm bushes and spindle, it is 50mm longer and 75mm wider than the standard Triumph Bonneville swinging arm. I have welded a mudguard close to the wheel; to cut down the spray off the roads and to add some extra bracing to the swinging arm. I drilled the standard Yamaha disc, fabricated a caliper mounting bracket and fitted a newer Triumph 4 pot (front) caliper to it. 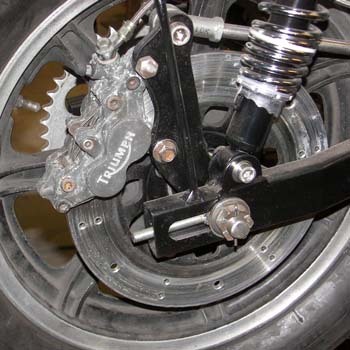 The torque arm has 12mm rose joints with 12mm SS rod linking them. The calipers and the shocks were bought from my favourite shop - eBay. 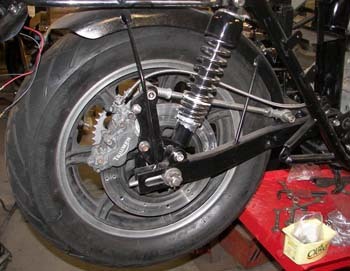 I had to turn down the Yamaha's front wheel spindle to make it fit the Triumph Bonneville forks. For the newer Triumph caliper to fit I had to grind off a section of the original caliper mount. The caliper mounting bracket is made from 12mm mild steel, and fits using the two original caliper studs.